(The month of May at Skratch Labs is #TakesAVillage. In this blog series I will be thanking all the people in my village who have helped me get to the start and finish lines). The center and foundation of my village...my beautiful mom. When thinking about the village of people - the support system - on whom I’ve depended to help me achieve my goals in life, the matriarch and center of that village is my mom. The beautiful thing about a mom like mine is that her love, support, and words have flowed through me and echoed in my ears for as long as I can remember. And they continue to do so even though she’s no longer physically here. She Provided My Foundation: The earliest memories I have of my mom may be fuzzy, but the emotions those memories evoke are clear. For as long as I can remember, my mom encouraged me to be myself - not to conform to societal norms. Granted, I had my share of whoopin’s for misbehaving. And of course she taught me basic rules of common decency, respect, manners, love, compassion, and those crucial qualities of what it means to be a human being. But I never felt an expectation beyond doing the best I could and being a decent person. She never made me feel “less-than.” Never made me question who I was. Although I may not have recognized it growing up, I see now as an adult that at the heart of every lesson my mom taught was that no matter what I did, she would always love me. Truly, unconditionally, love me. Admittedly I sometimes took that unconditional love for granted. But it was always there supporting me, sometimes in imperceptible ways. That unconditional love is the foundation on which everything else has been built. Like a house with weak a foundation, a person without that type of foundation eventually will crumble and collapse. Thanks to my mom’s unconditional love, I never have. In fact, that foundation of unconditional love is what has allowed me to grow, be fearless, thrive, and become stronger. 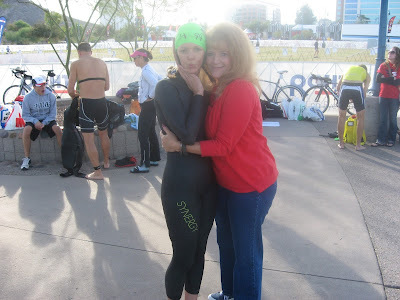 Mom and me during the swim practice at Ironman Arizona in 2011. There was never a better Sherpa. 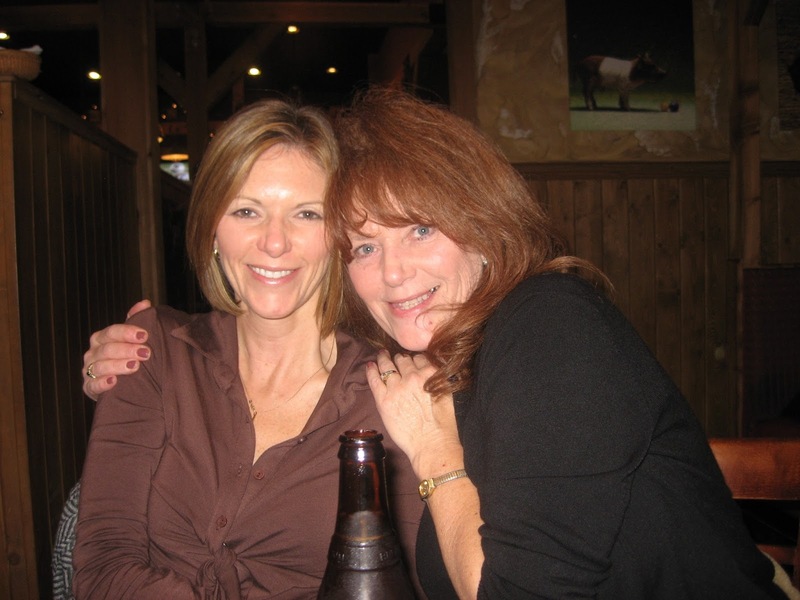 She Showed Me How To Hang With The Boys: Like my mom, I was and am a tomboy. Sure, just like my mom, I also clean up pretty well. But underneath the make-up, painted nails, and occasional dresses is a fiery girl who is far more comfortable drinking beer, cussing, and telling dirty jokes with the guys. When I was in elementary school, our teachers and principals had a policy that girls and boys could not play together at recess. (This was in the late 70’s/early 80’s, not colonial times). That didn’t sit well with a couple girlfriends and me who wanted to play football with the boys at recess. My mom even wrote a note to the school saying she had my permission to play football with the boys and wouldn’t hold the school responsible if I got hurt. The school wasn’t persuaded. So one day at recess, my friends and I put on a couple of the boys’ hooded sweatshirts and sneaked over to play football. A few minutes later we were busted. When we got called into the principal’s office, my mom came too. Let’s just say the teachers and principal got an earful that day from my mom about the absurdity of their policy. Because of my mom, I have never thought I had any limits because I was a girl. I have never doubted I can do anything just as well, if not better, than a man. I have never felt uncomfortable or intimidated in a room full of men. And I have never felt that I couldn’t stand up to a man. 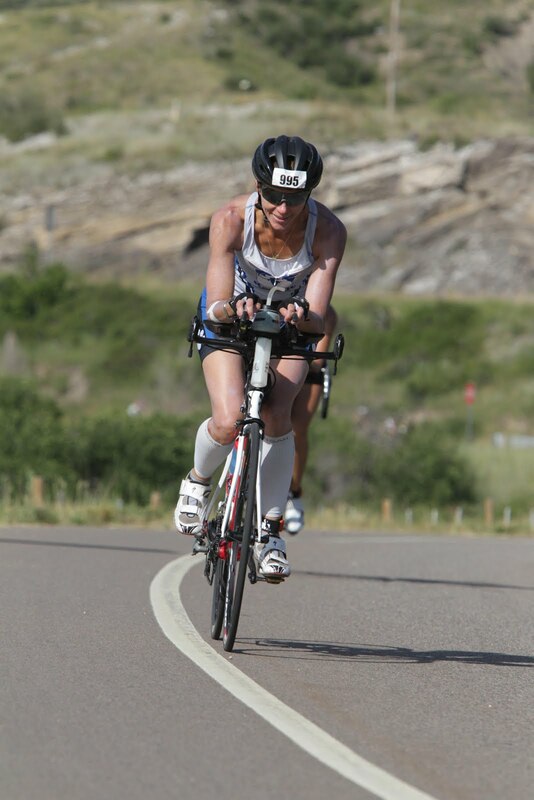 People sometimes call me an “Ironwoman” instead of an “Ironman.” Frankly, that bothers me. I earned the title of Ironman because I have done and will do things that most men cannot do. And that’s because of my mom. 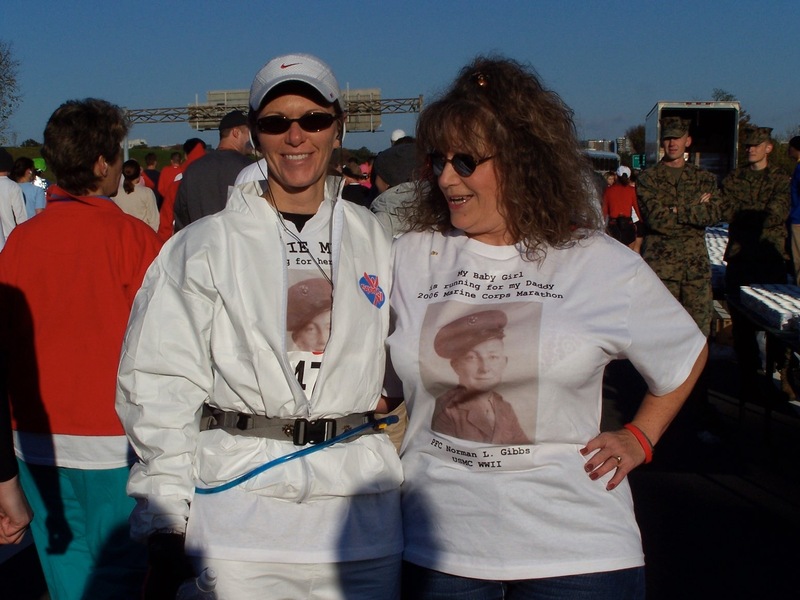 Before the start of the Marine Corps Marathon in 2006. I had shirts made for us with my grandpa's Marine Corps photo. She Taught Me To Help People: Many people thought of my mom as their mom. Her business card at work even listed her job title as “Office Mommy.” If there were one quality I had to pick that best represents my mom, it would be her limitless ability to help and care for others, especially those who were struggling or less fortunate. My mom had countless stories of standing up to bullies to defend other kids when she was growing up, giving care and support to people who didn’t have anyone else, and finding ways to encourage those around her. Because of my mom’s example, I am driven by a deep desire to help and inspire people every day, in even the smallest ways. That desire carries through to my training and races. My most rewarding moments on the race course actually aren’t when I cross the finish line. They’re when I know I’ve helped someone else cross the finish line. At the end of one race a few years ago, a woman came up to me and said that she’d been struggling during the race. She saw me ahead of her, liked my pace, and told herself that if she stuck with me she could finish the race. For me, that moment - realizing I had helped someone without even knowing it - was more satisfying than finishing the race. 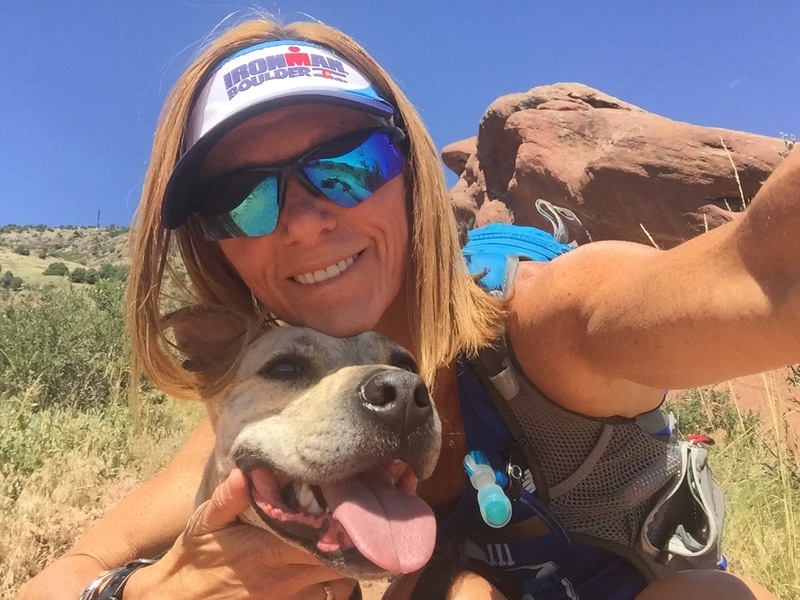 During every race, I shift the focus from my pain and misery to finding others who are struggling. I try to encourage them, give them a laugh. During Ironman Boulder in 2015 I handed out all my Tums tabs to other athletes who’d also gotten sick from swim. That desire to help is my mom, working through me, to lend a hand to those around me. It's what a village is all about - helping others. A proud Sherpa Mom after my Ironman Arizona finish. 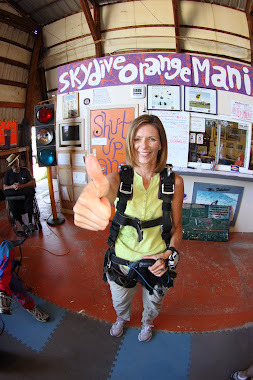 She Was My Original Sherpa: Growing up, my mom was at every, single event I had. From spelling contests in elementary school, to sporting events in junior high and high school, to moot court competitions in law school. And she was always the loudest parent there. It never embarrassed me. It made me proud to know my mom was letting everyone know she was cheering for her Baby Girl. My first marathon was the Marine Corps Marathon in Washington, D.C. in 2006, which I chose to honor my grandpa who was a Marine in WWII. My mom, without hesitation, flew from Nebraska to cheer for me. Navigating through thousands of people around the race course and cramming into D.C.’s metro like a sardine was a lot to ask of my claustrophobic mom. But she did it (along with her fiancé and several of my friends), just for me. She helped get me to the race start in the morning and helped me limping from the finish line at the end. 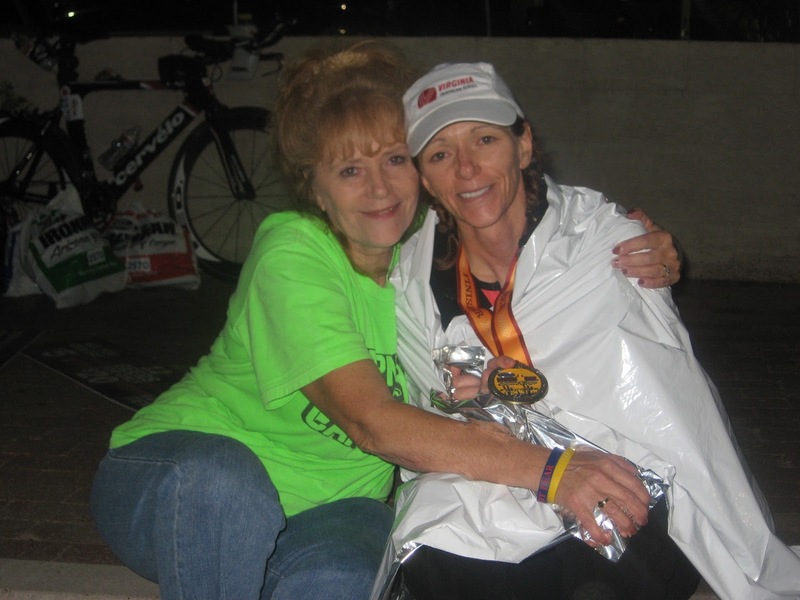 She also came to my first Ironman in Arizona in 2011. 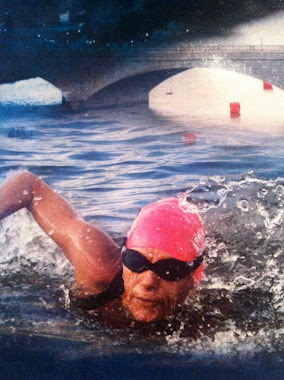 She lugged gear around for me during race check-in, made sure I found a warm neoprene cap and booties at the race expo for the bone-chilling swim, and she (along with several of my friends) hustled all over the race course to cheer for me. She even spotted me in the water during the swim - out of all those swimmers - and got some amazing pictures. At the finish line, she was screaming her lungs out. Her face was the first one I saw when I made my way out of the finishers chute. She wrapped me in her arms and kept saying how proud she was. When I said I couldn’t go another step, she hailed a pedi-cab to take us the three blocks back to the car. Ironman Arizona was the last event at which my mom was my Sherpa. But I still feel and hear her at every race I’ve done since then. My mom was my original Sherpa, my foundational support. She was and always will be, the matriarch of my village. She is the legend whose lessons live on, giving me and others within my village the courage, strength, and unconditional love to keep moving forward.